A pelican is always a good bird to see in New York State. Both American White Pelicans and Brown Pelicans are rare but regular, almost always showing up at least annually, usually somewhere along the coast for Brown Pelicans and either along the coast or on Lake Erie or Lake Ontario for American White Pelicans. 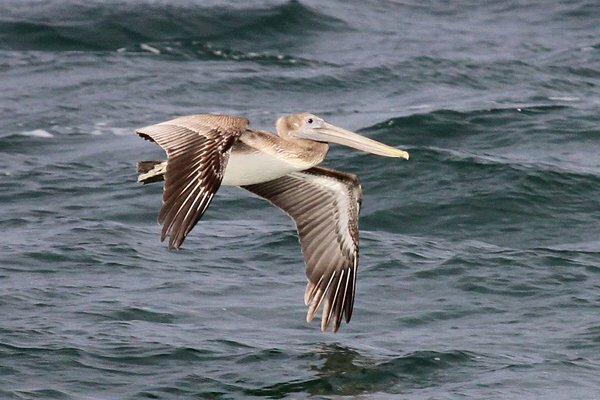 This year, however, the Brown Pelicans have been scarce and there haven’t been any that could be chased. You can imagine how crazy this drove Anthony Collerton, who has already broken the New York State big year record this year. He desperately wanted a Brown Pelican and he finally got one at Montauk Inlet at the very beginning of December. Fortunately for those of us who are not out almost every day looking for a pelican in the likely spots where one might show up, this bird stuck around and on Sunday Seth Ausubel and I were determined to see it. First, of course, we had to bird around Montauk Point a bit and then, after a couple of awesome hours, we made our way to Montauk Inlet from the east side. And we saw no pelican. And we saw no pelican. Sure, there were some nice close Razorbills, a bunch of plunge-diving Northern Gannets, lots of Common Loons, and various and sundry other fine feathered creatures but we wanted a pelican! Where was the pelican? Then Anthony arrived, accompanied by Derek Rogers, and they let us know that this particular Brown Pelican had become partial to hanging out on Montauk Lake which is connected to the ocean by Montauk Inlet. So instead of looking outward we should be looking inward. And then the Brown Pelican made the whole point moot by flying off the lake, up the inlet, and onto the west jetty. Later examination of photos led Seth Ausubel to discover that the bird is banded, as you can see in the picture above. 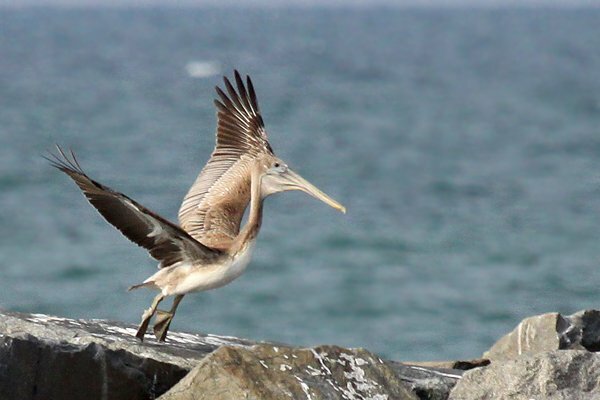 Unfortunately, the bird is also flighty, which means that it is unlikely that anyone will be able to get close enough to read the bands unless the pelican, which looks pretty thin and had been rather moribund, ends up having to be taken in for rehabilitation. There are reasons, after all, why pelicans tend not to be found this far north in December. It didn’t take long before a couple of people took their dog out on the jetty and the Brown Pelican took off, flew across the mouth of the inlet and then made like it was going to fly over our heads before deciding to head down the beach to the east instead. Not a bad bird in December in New York State! Evidently south Florida swapped you a Brown Pelican for a Razorbill. Thanks!